The Logboss is the lightest power to weight log splitter on the market. 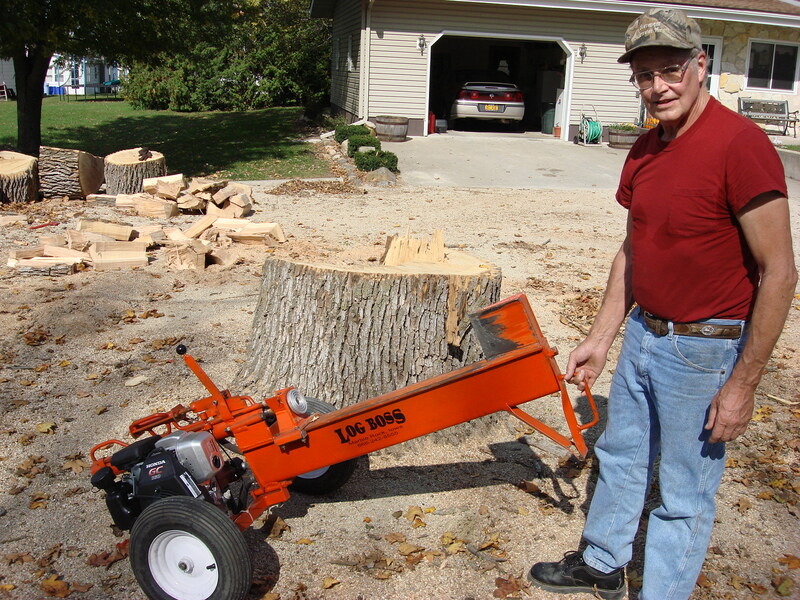 With the patented hydraulic pressure intensifier, the Logboss wood splitter can out split virtually any splitter of it's size. 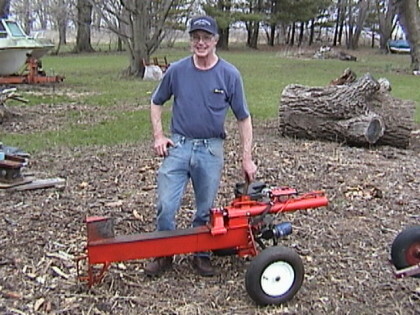 Dave is showing how easy it is to move the Logboss around. For any questions on new units give use a call. The Automatic Throttle Control on the Logboss makes it possible to make the most of your splitting time. Simply push the handle forward and the Logboss goes into full throttle mode, splits the wood and automatically returns, then idles down. The automatic operation can be overridden at any time. The combination gear pump and exclusive patented oil to oil piston type booster, provides two speed action for maximum performance. Using up to 18 tons of force moving 15 inches per minute quickly conquers the toughest knot. The easy going is taken care of by 6 tons of power at time saving rate of 2 feet in 15 seconds. The Logboss control valve has a built in load sensor that automatically shifts from high to low and back again as the load demands. Log to heavy to lift? the tilt down feature makes it easy. Position the Logboss beside the log. 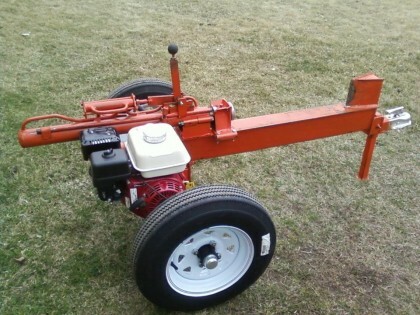 Loosen the linkage lock and tilt the frame onto the log. This enables you to split the log right on the ground without lifting it. The high strength aluminum alloy self aligning push pad on the Logboss is unique in the field. Through the use of a central pivot point and biting circular edges, positive grip is assured on any log regardless of the cut angle.